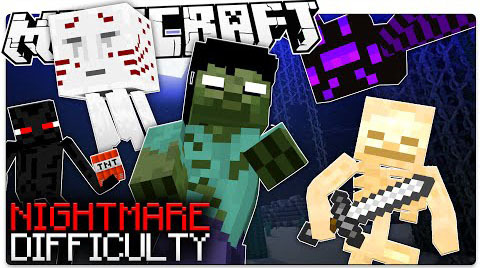 A new minecraft difficulty, NIGHTMARE MODE, where mobs are harder to kill and even less forgiving. Skeletons with weapon swaps, poisonous spiders, even EXPLODING ENDERMEN, all with this minecraft custom command that takes only one command block! Zombies can all break through doors. Zombies and Skeletons have their respective heads, thus do not burn in the day time. Spiders will immediately be replaced by Cave Spiders of the same strength. Ghast Fireball’s explosions will be *5 as large. Skeletons, when approached by foot, will switch to an iron sword when the player is close, and back to a bow when the player goes away. Endermen now will carry TNT, and explode when you are near them. Zombie Pigmen are always aggressive. All hostile mobs have roughly double attack damage, health, and follow range.